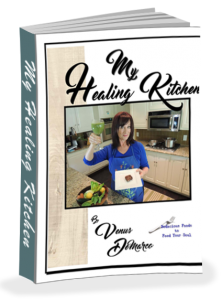 What Does a Healing Kitchen Mean to Me? I believe I came out of the womb loving food and animals. In fact when I was born there was a dog in our home named Penelope, and I remember a picture of me in a high chair eating a raw scallion—no fear of food here. And this love of eating, making food and feeding people has followed me through my life. I come from an Italian family. As far back as I can remember, gathering around food and people I love has given me a sense of comfort and love. Maybe this is why one of my love languages is making food for people. I believe that healing comes from many different avenues beside just from the nourishment of the food we eat. There is also a spiritual side of healing that comes from bonding and connecting with other humans. After all, we are pack animals and were meant to be together, not spending long amounts of time alone. Conversations during a meal gives a feeling of well being and belonging. Many people in this world have no sense of belonging, especially children. Social connections, like sitting down at a table eating together have been shown to increase happiness and alleviate depression. Preparing food gives your family a chance to broaden their world one food at a time. Most of all it accomplishes face-to-face interaction, which with all the distractions of technology devices these days, can be a rare event in some people’s lives. I remember as a teenager we had dinner together every night. Now there were times it was painful to sit with my family being a teenager and all, but most of the time it gave us all a chance to talk about our day, and even hash out some differences. My favorite memories were the meals around the big dining room table at my grandparent’s farm, the picnics at the lake with all my cousins, and my favorite of all was when the whole Demarco clan and their families got together for an Italian Christmas eve. These are great memories of gathering around the table with loved ones and our traditional foods. I wrote this book for many reasons, some I mentioned above. I wanted this book to be a companion to my first book My “Fearless” Journey that Healed Breast Cancer and my life. But my passion with this cookbook and any future books I write is to show that it is possible to make tasty, nourishing food without using any animal products or processed foods and that it doesn’t take any longer to prepare a homemade meal without these things. I wanted to give you recipes that are plant-based and full of micronutrients, phytonutrients, fiber, healthy fats, and much more. In today’s world you hear a lot about macronutrients—protein, carbohydrates and fats. What about a nutrient-dense diet as a lifestyle that goes so much further than calories and how many carbs you took in for the day? I have been a vegetarian and a vegan before in my lifetime, then went back to eating animal products in my late thirties until I was diagnosed with breast cancer in 2009. After lots of research and my background in healthy living and nutrition I decided to turn down conventional treatments for cancer, which are surgery, chemotherapy and radiation, for the natural route or God’s way. This was to give my body all the nourishment it needed to heal and to eliminate the foods that fed cancer. Some of these foods were animal products of all kinds including dairy, refined sugars and processed foods. The body is an amazing machine and is capable of more than we give it credit for. Food was put here on the earth for our nourishment. This cookbook is not just for vegans, but for anyone who would like to try new foods, many that will remind you of some of your favorite comfort foods. This cookbook is also for those who would like to slowly transition into a plant-based lifestyle, maybe by just doing a meatless day once a week. Or; even better, how about having two meatless meals a day. Many of these recipes can substitute for some of your sides or desserts so you can give your family and friends some gluten-free, dairy and refined sugar-free options. Before I was living a vegan lifestyle I chose it for the compassion of animals. This time it started out for the health benefits, then became a compassionate issue. I hear people say all the time how much they love animals, especially their pets. I know if the masses understood the cruelty that happens on factory farms, they would eat less animal products. I know people feel that cats and dogs are different than cows, chickens and pigs. But there are countries that raise dogs and cats for food. For me something changed deep in my core after being a vegan for a while. I felt no need to hurt another living creature for my food source and that’s what I call a kind and loving food plan. Now with all that said I am not a crazy vegan, judging people for their food choices. I think understanding what labels really mean and even cutting down on your meat and dairy consumption will have a great impact on the earth and your health. I will mention this throughout the book quite often: buy local organic and Non GMO foods whenever possible. It’s all about supply and demand—if you don’t buy foods that are processed and full of chemicals and you say no to the cruel treatment of animals, there will have to be change to our food source. So let’s get Fearless and start preparing some Healthy food today. Let’s get back into the kitchen, and get your family and friends involved. Let’s celebrate food! To your health, the prevention of disease, and a long happy life, through faith, fun, and food!